WITH AMPHI FESTIVAL TO THE PERFECT EASTER GIFT! Easter is just around the corner and a great opportunity to delight your friends, acquaintances, family or even yourself with a nice gift! Although there may be ideas aplenty, having a festival experience like Amphi absolutely stands out as something extraordinary! The original Amphi hardtickets (weekend- & day tickets) are exclusively available at www.amphi-shop.de – the official Amphi Ticketshop. 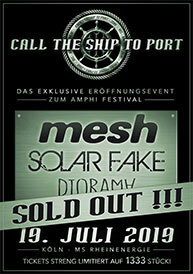 Amphi tickets are also available via CTS/Eventim! In terms of electronic sounds expect a chummy bat over the hat by NITZER EBB, PROJECT PITCHFORK, HOCICO, NACHTMAHR, FADERHEAD, SPARK! and many more. Darkwave- and synth-fans will agree about the excellence of BLUTENGEL, WHITE LIES, L'ÂME IMMORTELLE, DAS ICH, SOLITARY EXPERIMENTS, THE BEAUTY OF GEMINA, PINK TURNS BLUE or HENRIC DE LA COUR, just to mention some. Plus you're going to rock out at large scale with the incredible IN EXTREMO, LORD OF THE LOST, FEUERSCHWANZ, UNZUCHT, SAMSAS TRAUM, SCHATTENMANN and even more! Anticipation increases when thinking of the lavish BEACHCLUB with its beach bar, the unique MEAD-LOUNGE providing a nice oversight across the festival-spectacle around you and the MS RheinEnergie invites you likewise to enjoy conversations in the relaxed atmosphere of the ship's SUNDECK. Of course we still plan a series of autograph sessions, a large gothic market and after-show parties on both of the festival days! And the best of all this: on 20. & 21.07.2019 the time will already be on to dive into the big celebration at Tanzbrunnen Cologne, along the beautiful Rhine! An experience not to be missed in any well assorted Easter nest...! FIRST AMPHI TRAILER 2019 ONLINE! 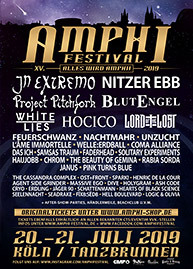 Amphi Festival 2019 - soon the time is on again! This time with In Extremo, Nitzer Ebb, Blutengel, Project Pitchfork and many more! 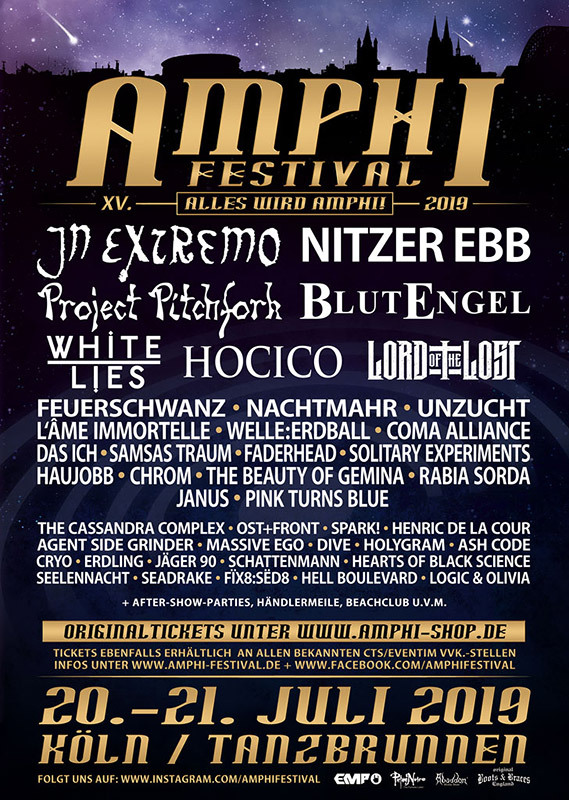 AMPHI 2019 - WARM-UP PARTIES! A couple of dates will still be added, so make sure to check back every now and then! Official pre-party tickets are available now at Amphi Shop, www.amphi-shop.de , at all nationwide CTS/EVENTIM box-offices, online at www.eventim.de , www.oeticket.com , www.ticketcorner.ch and as PRINT@HOME edition. WHITE LIES & 3 MORE BANDS TO COMPLETE THE AMPHI 2019! Please be advised there have been made two changes to the line-up by days for programme related reasons. 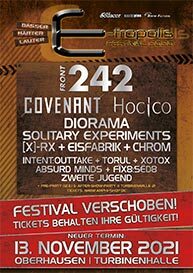 As announced a few days ago on facebook, UNZUCHT will now play on Saturday, 20.07., (the original date was 21.07.). The same also goes for LORD OF THE LOST. Chris Harms and his men will now rock the mainstage on Saturday, 20.07., (instead of 21.07.). We ask for your kind understanding.